The Thunder, presented by NJM Insurance, are pleased to announce that Patrick Osborn has been named Manager for the 2019 season. 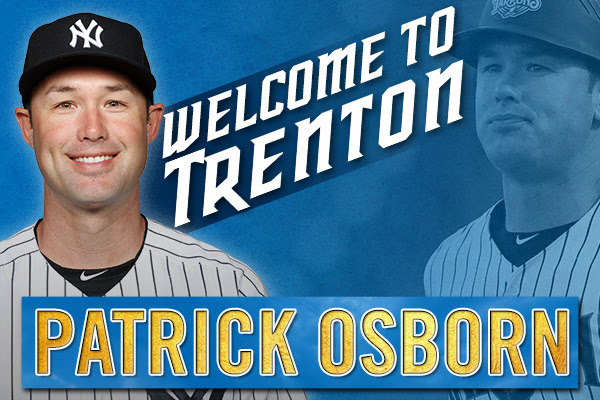 Osborn will be joined by Pitching Coach Tim Norton, Hitting Coach Ty Hawkins, Defensive Coach Raul Dominguez, Bullpen Coach Jason Phillips and supported by Athletic Trainer Jimmy Downam and Strength & Conditioning Coach Anthony Velazquez. "I'm thrilled to welcome Patrick Osborn to the Thunder for the 2019 season," said Thunder GM/COO Jeff Hurley. "There has been a long history of excellence on the field for the Thunder and I am thrilled to see Patrick continue that tradition." Osborn becomes the 12th Manager in franchise history and seventh since the affilation began with the New York Yankees in 2003. A second round selection of the Cleveland Indians in 2002 out of the University of Florida, Osborn spent five seasons in the organization playing mostly at third base. No stranger to the Eastern League, Osborn played in 298 games with the Akron Aeros across the 2005-2007 seasons. 2019 marks the sixth season as a Manager in the Yankees organization for the Bakersfield, California native. Osborn's managerial tenure has seen him make a stop at each level of the Yankees organization beginning with GCL Yankees 2 in 2014 where he led the Yankees to a Northeast Division Title. After one-year stops in Staten Island (2015), Tampa (2016) and Charleston (2017), Osborn led the 2018 Tampa Tarpons to a 70-67 record. In 2015 and 2016, Osborn led Yankees affiliates to league runner-up finishes and was named the 2016 Florida State League Manager of the Year. Osborn's playing career totaled 546 games between the Indians and Astros organizations, batting .274 with 26 home runs. The former infielder also played three seasons with the independent Southern Maryland Blue Crabs where he set a franchise record with 423 hits and spent three seasons as Manager across the 2011-13 seasons, leading the Blue Crabs to three straight postseason appearances. A graduate of Bakersfield, H.S. (Calif.) in 1999, Osborn spent three seasons at the University of Florida (2000-02). In his final season with the Gators, he led the team with 104 hits and a .414 batting average and added 17 home runs and 75 runs batted in. Pitching Coach Tim Norton returns for a second season as a coach in Trenton. In 2018, Norton oversaw a staff that led the Eastern League in ERA (3.25), fewest hits allowed (1,030), fewest home runs allowed (86), strikeouts (1,221), and lowest WHIP (1.213). Four pitchers from the Thunder's Opening Day roster in 2018; Domingo Acevedo, Caleb Frare, Justus Sheffield and Stephen Tarpley, would each eventually reach the active roster for a major league team later in the season. 2019 will be Norton's ninth season as a coach in the Yankees organizations following a five-year playing career in their system. A seventh-round selection in the 2006 draft out of the University of Connecticut, Norton is one of just three former Thunder players to return as a coach, joining Justin Pope (Pitching Coach, 2011) and PJ Pilittere (Hitting Coach, 2015-16). Hitting Coach Ty Hawkins continues his second stint as a member of the Thunder coaching staff. Hawkins coached the Thunder offense to a third consecutive playoff appearance in 2018 and aided outfielder Trey Amburgey a career season that culminated in a selection to the Eastern League's Postseason All-Star team. Hawkins enters his 21st season as a coach in the system which includes stops in the GCL (1999-2001, 2017), Single-A Greensboro (2002), Single-A Battle Creek (2003), Single-A Tampa (2004), the Thunder (2005) and ten seasons at short-season Single-A Staten Island (2006-2015). Hawkins spent the 2016 season as a roving hitting instructor for the organization. Hawkins coached at Vanderbilt University and the University of Illinois after a collegiate playing career at Old Dominion University where he helped his team advance to the 1990 NCAA Central Regional as a senior. Defensive Coach Raul Dominguez returns for a second season on staff with the Thunder. A former minor league outfielder, Dominguez served as Defensive Coach for the Tampa Tarpons in 2017 and spent the previous eight seasons as a Manager with the GCL Yankees East (2016), DSL Yankees 1 (2011-15), and DSL Yankees 2 (2009-10). Bullpen Coach Jason Phillips played for seven seasons in the major leagues and begins his first season as a coach in the Yankees system. Drafted by the New York Mets in the 24th round in 1997 out of San Diego State University, Phillips made his major league debut on September 19, 2001 with the Mets. After a playing career with the Mets, Dodgers and Blue Jays organizations, Phillips accepted his first post-playing role as Bullpen Catcher for the Seattle Mariners in April of 2009. After spending seven seasons with the Mariners, Phillips spent three seasons as a Bullpen Catcher for the Toronto Blue Jays. Jason's brother, Kyle, also reached the major leagues as a catcher with the Toronto Blue Jays (2009) and San Diego Padres (2011). Athletic Trainer Jimmy Downam returns for a third season with the Thunder and seventh overall in the organization. A native of Somers Point, N.J. Downam spent the 2014-16 seasons with the Charleston RiverDogs and the 2013 campaign with the Staten Island Yankees. Downam spent the 2012 season as an intern with the Philadelphia Phillies organizations at the team's rehabilitation facility in Clearwater, Fla. A 2009 and 2012 graduate of Liberty University (Va.), Downam resides in Tampa, Fla. Strength and Conditioning Coach Anthony Velazquez returns for his third season in Trenton and his sixth overall with the organization. Prior to his tenure with the Thunder, Velazquez spent three seasons with the Charleston RiverDogs and the 2013 campaign in the same position with the Clearwater Threshers, Single-A affiliate of the Philadelphia Phillies. Velazquez held strength and conditioning positions at the University of Michigan, University of South Florida and the University of Maryland before his time with the Phillies and Yankees. Rounding out the staff for 2019 are Clubhouse Manager Harris Seletsky and Video Manager Mike Triller.